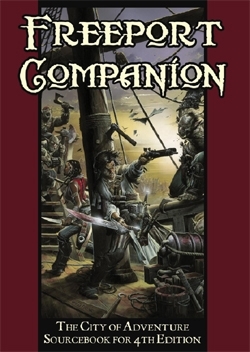 Avast ye scurvy dogs and prepare your game to be boarded by the Freeport Companion compatible with the 4th Edition of Dungeons & Dragons! Complementing the Pirate's Guide to Freeport published by Green Ronin in 2007, this 176 paged tome will make Freeport accessible for 4e campaigns, complete with races, the corsair class, equipment, monsters, an insanity system, magic items and rituals, notable Freeport characters, and an introductory adventure. This title was added to our catalog on January 04, 2010.